There is not much enthusiasm among the people of Karnataka in the elections to Karnataka Assembly slated for May 12. 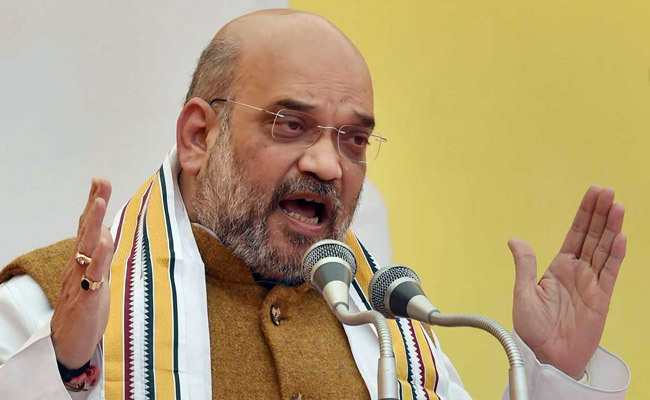 BJP president Amit Shah (in picture) and Karnataka chief minister Siddaramaiah are to be blamed for the lack of interest among the people and the absence of an ‘election wave’. It was being hinted in the run-up to the election that BJP will give preference to new faces. But that hope was dashed when the BJP list for Karnataka had a whole lot of supporters of tainted Bellary mining baron G. Janardhana Reddy. It was apparent that Amit Shah was only interested in winning Karnataka by hook or by crook. He ended up giving tickets to whole lot of criminal elements and politicians who had spent time in jail for indulging in corrupt deals, including its chief ministerial candidate B.S. Yeddyurappa. Karnataka people who are sick of the communal politics of the BJP, have hardly any choice because the rival Congress party does not have much to offer to the people either. The lack of choice is the reason for the lack of enthusiasm among the Karnataka electorate who are caught between the devil and the deep blue sea. If Coorg (Kodagu) district in Karnataka can be taken as a microcosm of what is happening across the state, then the reason for the absence of the election fever in Karnataka can be explained. The people of Coorg had hoped that the BJP would field fresh faces, in the place of tainted party MLAs for the Virajpet and Madikeri seats. The BJP MLAs had been permanent fixtures for the last few terms. The duo were suspected to have been giving protection to all the illegal deals, involving timber smuggling, sand mining, land-grabbing and other nefarious activities. But the people’s expectations were belied when the BJP fielded the same old faces, whose only qualification was ‘winnability’, the main qualification for landing a BJP ticket. The people of Coorg have no choice other than to support the BJP because the credentials of the Congress are dubious. Chief Minister Siddaramaiah of the Congress had antagonized the people of Coorg by observing the birth anniversary of 18th century Mysore ruler Tipu Sultan. Tipu Sultan had butchered a lot of Kodavas (Coorgs) and also converted many Kodavas to Islam. The violence and the mayhem which followed Tipu anniversary had led to bloodshed in Coorg. In the circumstances, people are wary of the Congress. While he has antagonised the Coorgs, Siddaramaiah’s policy of doling out ‘freebies’ has gone down well with the poorer sections. When this reporter recently visited the party office of the BJP at Gonikoppal town in Coorg, it was empty, except for a few hangers on. This despite the fact that the BJP is flush with funds. The lack of developmental agenda and the prominence being given to emotive issues has left the voters disinterested in Karnataka politics. The total absence of any wave has made it difficult to make out which way the wind is blowing in Karnataka.